Start reading Ringworld's Children on your Kindle in under a minute. Larry Niven is the award-winning author of the Ringworld series, along with many other science fiction masterpieces, and fantasy novels including the Magic Goes Away series. His Beowulf's Children, co-authored with Jerry Pournelle and Steven Barnes, was a New York Times bestseller. He has received the Nebula Award, five Hugos, four Locus Awards, two Ditmars, the Prometheus, and the Robert A. Heinlein Award, among other honors. He lives in Chatsworth, California. An epic end to an epic saga. Was a pleasure to read and return to known space again. Highly recommended. I met Larry Niven (Lawrence Van Colt) back in 1983! Yes, it was over 21 years past at the Midland, Michigan Science Fiction conference. I kept asking Larry if he was ever going to write about Louis Wu and Known Space again. Larry kept telling me "no" ("rats", I thought). I was a poor college student and could not afford to buy both Larry and Dr. Pournelle dinner to continue the wonderful discussion of Larry's writing. Being a broke college student sucked when you meet your favorite author. For a good many years Larry kept his word about not writing about Ringworld and wrote about Smoke Rings, Alien invasions, and monsters-on-speed. Then he "licensed" out his Kzinti aliens for the various war novels. 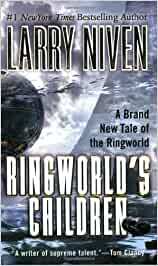 Finally in the late 1990s Larry wrote "Ringworld Throne". I didn't like the novel but gave it a fair review. Face it, Hillary Clinton could have ghost written "Throne" and I would have given it a fair review. Well, "Children" is just as good as Ringworld and Engineers. Louis Wu returns fit, tanned, and rested. He is a delight. Larry keeps the Puppetteer "Hindmost", Chmee's son, a new protector called Tunesmith, and introduces us to both new Pac Protectors and personnel from ARM. Larry did a great job of writing. The origins of the auto-doc that saved Louis Wu's life is expained. The technology for the uber-auto-doc didn't exist back in 1970 when Larry first wrote the Ringworld Novel. This auto-doc is copied to do many wonderous things. Larry also explains the Ringworld a lot better. The Pac are now fully extablished as the rightful guardians of the Ringworld. The ram-jets used for control of the Ringworld in the plain of orbit were to be replaced. Why they were not replaced is a great read. The protector Bram, killed in the previous novel, is found to have been a dreadful protector in charge of the maintenance of Ringworld. Larry really goes to examine the quasi-culture of the Pac protectors. In many of the novels involving Pac they are merely seen as ultra-bright killing machines. However, in this novel they work together to save the Ringworld. Yes, this time the Ringworld is threatned by ARM, the Kzin, and Outsiders. Years past I would have wanted ARM to win. However, Larry does a great job of filling in some of the blanks about the operations of ARM. The people who run ARM are not nice and a little ruthless. Imagine the UN as an all-powerful government agency with all of the caring of the IRS or Enron. A typical reader will end up wanting the allied forces of the Ringworld to win. Larry also ties in anti-matter to the Ringworld. Where is this anti-matter found and how does it tie into Known Space? You have to go ALL THE WAY BACK TO NEUTRON STAR!!! Yep, the anti-matter of a short story in Neutron Star is tied to Ringworld. That is over a 35 year gap in story telling. Larry keeps the natives of Ringworld out of the action to a lessor extent. Why? Well, breeders are sort of like pets. There is a full war going on in the Ringworld star system. When massive forces fight, the only thing that happens is lots of innocents are killed. Anti-matter is nasty and ARM has a big supply of it. I'm not going to give away much about this novel except these two facts: Larry pretty much takes any possibility for a Ringworld follow up out of the picture but Larry leaves open the possibility of lots of new Know Space adventures. Read the novel and find out why!!! Larry, if you ever read this review I want to tell you that "Children" is lots better than "Throne". Oh, I'm no longer a "broke" college student so I can finally buy you and Dr. Pournelle that good dinner. Amazon.com readers and Larry Niven fans, You will like "Children", trust me.